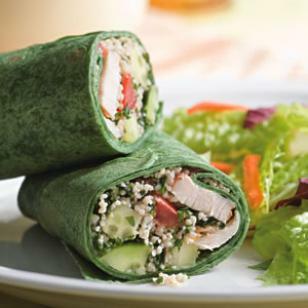 Healthy Recipe: Wrap It Up! Bring water to a boil in a small saucepan. Stir in couscous and remove from the heat. Cover and let stand for 5 minutes. Fluff with a fork. Set aside. Meanwhile, combine parsley, mint, lemon juice, oil, garlic, 1/8 teaspoon salt and pepper in a small bowl. Toss chicken tenders in a medium bowl with 1 tablespoon of the parsley mixture and the remaining 1/8 teaspoon salt. Place the tenders in a large nonstick skillet and cook over medium heat until cooked though, 3 to 5 minutes per side. Transfer to a clean cutting board. Cut into bite-size pieces when cool enough to handle. Stir the remaining parsley mixture into the couscous along with tomato and cucumber. To assemble wraps, spread about 3/4 cup of the couscous mixture onto each wrap. Divide the chicken among the wraps. Roll the wraps up like a burrito, tucking in the sides to hold the ingredients in. Serve cut in half. Per serving: 479 calories; 17 g fat ( 3 g sat , 11 g mono ); 67 mg cholesterol; 49 g carbohydrates; 0 g added sugars; 34 g protein; 5 g fiber; 653 mg sodium; 382 mg potassium. Nutrition Bonus: Vitamin C (57% daily value), Folate & Vitamin A (40% dv), Iron (32% dv). Previous Back Pain: Snap Out of It!